Please read the terms of service below. These terms of service, including any revised agreements that we may post from time to time, state the terms and conditions under which semalt.com provides you with various services (a "Site"). All services provided on the Site are collectively referred to as "semalt.com". Contents of our Site are intended for the personal use of our users. All right, title and interest to the content displayed on our Site, including but not limited to the Site's look and feel, data, information, text, graphics, images, designs, trademarks, service marks, trade names, URLs and content provided by third parties, are the property of semalt.com, or the respective third parties, and are protected by copyright, trademark, patent or other proprietary rights and laws. Except as expressly authorized by semalt.com, you agree not to copy, modify, rent, lease, loan, sell, assign, distribute, perform, display, license, reverse engineer or create derivative works based on the Site or any Content available through the Site. Semalt.com may make changes to this Agreement from time to time in its sole discretion. Each time changes are made to this Agreement, a revised Agreement will be posted on the home page. Your continued use of any of our Site following the posting of changes constitutes your acceptance of any such changes. You are hereby granted a personal, nonexclusive, nontransferable, revocable, limited license to view, reproduce, print, cache, store and distribute content retrieved from our Site via a generally available consumer web browser, provided that you do not (and do not allow any third party to) copy, modify, create a derivative work of, reverse engineer, reverse assemble or otherwise attempt to discover any source code, sell, assign, sublicense, grant a security interest in or otherwise transfer any right in the semalt.com Services or remove or obscure the copyright notice or other notices displayed on the content. You may not reproduce, print, cache, store or distribute content retrieved from the Site in any way, for any commercial use without the prior written permission of semalt.com or the copyright holder identified in the relevant copyright notice. You agree not to modify the semalt.com Services in any manner or form, or to use modified versions of the semalt.com Services, including (without limitation) for the purpose of obtaining unauthorized access to the semalt.com Services or portions of the Services. You agree not to access the semalt.com Services by any means other than through the interface that is provided by semalt.com for use in accessing the semalt.com Services. Except as expressly provided in this Agreement, nothing contained in this Agreement or on the Site shall be construed as conferring any other license or right, expressly, by implication, by estoppel or otherwise, with respect to any of semalt.com Content or under any third party's Content. Any rights not expressly granted herein are reserved. semalt.com reserves the right at any time and from time to time to modify, suspend, discontinue or terminate the semalt.com Services (or any part thereof) with or without notice. You agree that semalt.com will not be liable to you or to any third party for any modification, suspension, discontinuation or termination of the semalt.com Services. - semalt.com Services are provided for informational purposes only. No content on our Site is intended to constitute professional. Semalt.com or otherwise providing information, services or material on our Site are not responsible or liable for any consequences relating directly or indirectly to any action or inaction you take based on the information, services or other material on our Site. - Your use of the semalt.com Services is at you sole risk. The semalt.com Services are provided on an "as is" and "as available" basis. Semalt.com expressly disclaims all warranties of any kind, whether express or implied, including, but not limited to, the implied warranties of title, merchantability, fitness for a particular purpose and non-infringement. - Semalt.com makes no representation or warranty that semalt.com Services will meet your requirements, that the semalt.com Services will be uninterrupted, secure, current or error-free, that the results that may be obtained from the use of the semalt.com Service will be accurate, timely, useful or reliable, or that the quality of any postings, products, services, information or other material obtained by you through semalt.com Services will meet your needs. 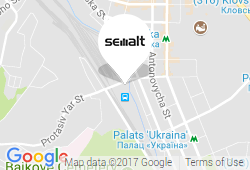 - Any material obtained through the use of semalt.com Services is done at your own discretion and risk, and you will be solely responsible for any damage to computer systems or for loss of data that results from the download or use of any such material. - No advice or information, whether oral or written, obtained by you from our Site or through or from the semalt.com Services shall create any warranty not expressly stated in their terms. You understand and agree that semalt.com is not liable for any indirect, incidental, special, consequential, exemplary or punitive damages, including, but not limited to, any loss of use, loss of profits, loss of data, loss of goodwill, cost of procurement of substitute services, or any other indirect, incidental, special, consequential, exemplary or punitive damages, howsoever caused, and on any theory of liability, whether for breach of contract, tort (including negligence and strict liability), or otherwise resulting from: (1) the use of, or the inability to use, semalt.com Services, (2) the cost of procurement of substitute services, goods or and web sites, (3) unauthorized access to or alteration of your transmissions, (4) the statement or conduct of any Third Party on our Site, (5) reliance on content on our Site, or (6) any other matter relating to our site or semalt.com Services. These limitations will apply whether or not semalt.com has been advised of the possibility of such damages and notwithstanding any failure of essential purpose of any limited remedy. You agree to indemnify and hold semalt.com, its affiliates, and their officers, directors, employees and agents harmless from and against any and all liability, losses, claims, demands, disputes, damages or costs of any kind, including, without limitation, reasonable attorneys' fees and costs of litigation, resulting from or in any way connected with (a) your use of or reliance on semalt.com Services, (b) your connection to our Site, (c) your violation of this Agreement, or (d) your violation of any rights of another party.